Posted November 5, 2018 at 12:06 am . 1 comment. B&H Photo Video has a one-day deal on the popular Rokinon 14mm f/2.8 IF ED UMC For Canon with AE Chip, it is now only $349.00. This is a version of a very popular astrophotography lens, but it also includes a special chip that allows the lens to work with the camera’s focus confirm, auto exposure, auto metering and auto white balance functions. Save $150 from the regular price of $499. The Lonely Speck calls this “arguably the best, most affordable lens for astrophotography”. This deal is available today only or until sold out. Pretty good deal if you have a full frame camera. 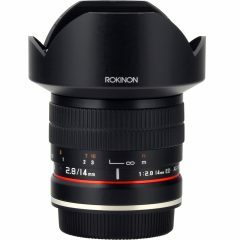 Still works for crops as well, but for this price I would prefer the 10mm F2.8 from Rokinon for astro at a wide angle, though that lens is full manual with no chip. If using only for astro shooting the non-chip version of the 14mm is available pretty often for a lower price than this (I can’t recall what I paid, but it was definitely under 300), but that chip makes it handy for typical landscape shooting as well.